This past Saturday, Dear and two of his GM drove out to the far reaches of Brooklyn to deliver a pig and some pastries in exchange for my hand in marriage. I feel really bad that one of the GM drove for 2 hours from CT to get to NYC to do this. Thankfully my mother didn't insist on rescheduling this two days before, when she realized that she had mis-read her Chinese calendar. I also am relieved that Dear was allowed (at the last minute) to come inside, otherwise the GMs would have been completely lost in a sea of outdated traditions, amongst ppl they've never met. While we waited for them to arrive, two of my aunts (the ones who kept feeding my mother all the traditions that need to be followed) gave me marriage advice. Most of it I barely understood (or ignored, since they can be quite annoying) and I just nodded my head. The only thing I remember is my aunt telling me my duties as a wife would be to cook and clean (I wanted to wring her neck for that) and that I would have to say good morning to my ILs (as if I lost all common sense or politeness). It's just so different to hear this subservience junk, as compared to the advice I got at my shower. Anyway, when the entourage arrived around 11:15 (I think), I scurried upstairs since I wasn't allowed to be seen. I hovered at the top of the steps to catch glimpses of what was happening (mostly saw ppl's legs and feet) and I also tried to listen so that I could picture the events happening below me -- have to watch the tape that GM was shooting. In the meantime, pictures that the other GM shot help fill in a lot of the blanks. I actually watched as the car was unloaded -- I was surprised that everything fit b/c I had heard stories of how ppl had to fold down their seats to fit the pig but there was room to spare in the trunk. 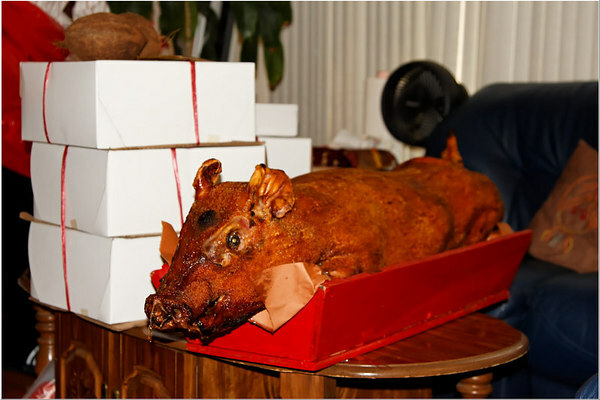 Sounds gross, I know, but the pig was covered in paper and taped to the box. 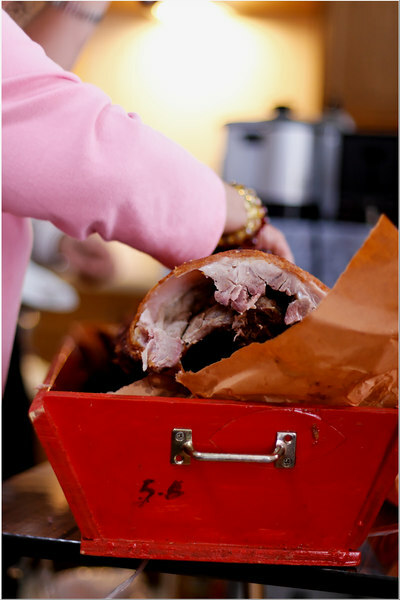 I love the wooden red tray that the pig came in. After the coconuts, two envelopes of money were presented, one for the numerous dried goods that were requested and one as dowry money. Two pairs of chickens and a pair of pants for my brother were also in the lineup. 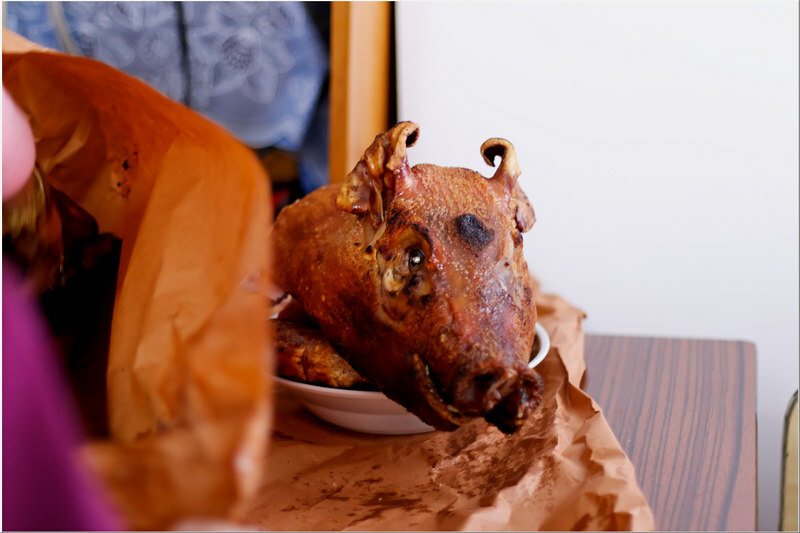 The chickens were completely intact (with neck and innards) and raw (not what I expected, but better than what some old lady told FFIL while he was ordering the cakes in the bakery -- she said the chickens had to be alive and sqawking). The pig is ushered into the dining room/kitchen to be chopped up. My other aunt examining the pig for the best angle to chop its head off. 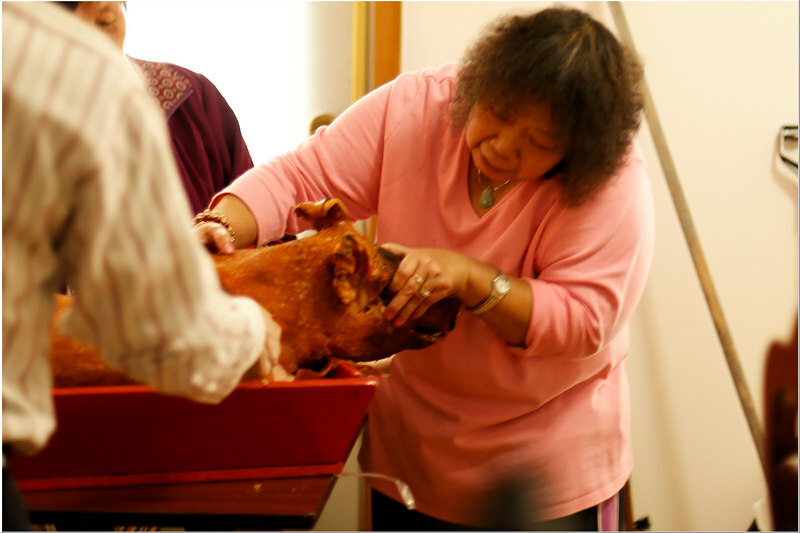 This aunt eventually did all the chopping b/c everyone else was too scared or didn't know how. From upstairs I just heard each person pass the buck and tell the other person to cut it. This is also the aunt that kept calling one of the GMs "pretty boy" in Chinese, which I couldn't stop laughing about from upstairs. The pig, slowly being divided up. Did I say how much I really like the box? It comes with handles too! I'm thinking of turning it into a planter or a magazine rack or something. Let's hope all this rain hasn't completely destroyed it as FMIL left it outside in her backyard. 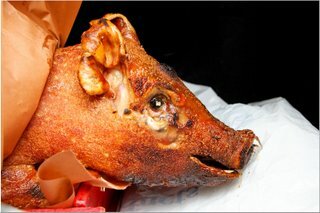 The pig's head, returned to the groom, along with its tail. The groom also got a wallet (with some money in it), a belt, some of the pastries, some of the pork, all the bed linens we had bought, and two of the chickens back. My mother also returned half of the dried goods money and a significant portion of the dowry money for Dear to buy a suit. 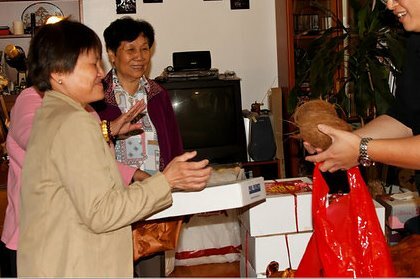 She also put red envelopes with a small amount of money in each of the things that the groom took away and everyone there got red envelopes for helping out (the GMs, my aunts). 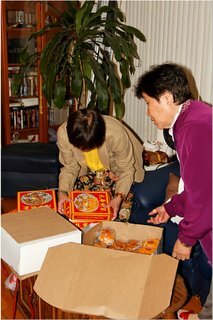 My mother and aunt dividing up all the pastries into the more decorative red boxes to give out to the rest of my family. Along with the pastries, they also delivered the invitations (way late) complete with the cake cards to get even more pastries, and a slab of the roast pork. 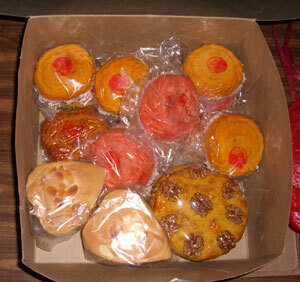 I think one of the pastries is missing, b/c I thought there were supposed to be six types. I tried two of the ones above and they both have a very flaky crust (must be a lot of lard) with the thick and sweet lotus seed filling often found in Chinese pastries. The one I had on Saturday reminded me of a plain mooncake without the yolk centers. This morning, the one I had threw me for a loop as it had thin slices of pickled ginger in the middle, along with half a pickled egg (the kind that you get when someone gives birth -- ick!). I really want to try the large almond cookie but I feel guilty b/c it's really huge! 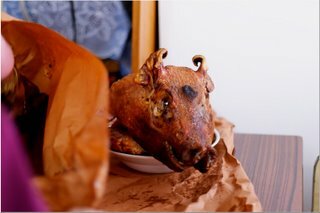 After the guys left, my family had a small lunch (just pork and rice, no vegetable!!) b/c I think my parents forgot/did not know that they were supposed to cook a meal for all of us. The pork tasted pretty good (not very fatty), was about 100 pounds altogether I think, and came from the meat market on Catherine Street by the Golden Carriage bakery. Not having dealt with them, I give them an A for value (about $1/lb), taste, their thoughtfulness to provide the red tray (I later learned the box cost extra but a nice touch), convenience, and general doing exactly what was asked of them at the time they were asked to. Here's looking at you kid, er... um... pig? 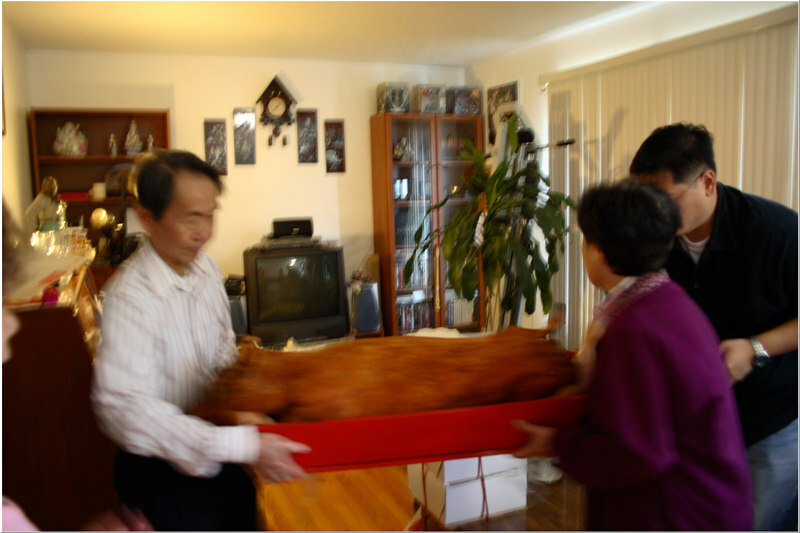 And my mother wanted to get the pig cards (like gift certificates) instead of the actual pig.... I think aside from the huge headache of all this, things turned out alright and definitely created some memories (and only lasted about an hour). Such fun reading all the juicy details...you should really consider adding a link to your blog from your official wedding site.